With the Disqus update a few months ago, some users pointed out the commenting service’s Discovery feature. The Discovery feature shows links to other sites’ content at the bottom of your posts. When I checked to see if the feature was active on my site when the Discovery feature was released, it did not appear active so I left Disqus alone. 2/23/13 UPDATE - I forgot the Pebble charger at a location which I can only travel to once a week. I used my Pebble watch last Saturday and Sunday (2/16-17) and turned it off during the week until I could get the charging cable today (2/23). On Thursday (2/21) I tried to turn on the Pebble and it had no response) Today (Saturday), I plugged in my Pebble to the charger and it is still dormant. The Pebble watch cannot handle outdoor running and being turned off. Asking for a refund/exchange; will update on progress soon. 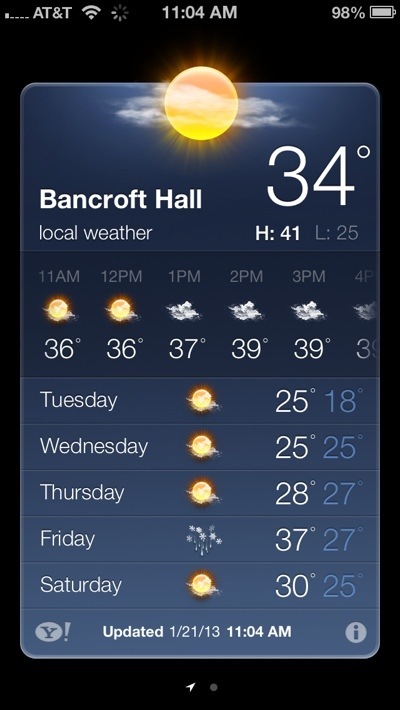 Looks like Bancroft Hall’s 4000 lucky residents now have the hall represented in the Weather app. Bancroft Hall has its own postal code of 21412, too. As most of us know, Casio puts diagnostic and service modes into almost all of their products. From the big screened graphing calculators to the budget scientific, there have been diagnostic — and sometimes service — modes existing. Sometimes you want a newspaper’s mobile app to give you interactive features that you won’t find in a print copy of the magazine. Other times however, you just want to read the news.